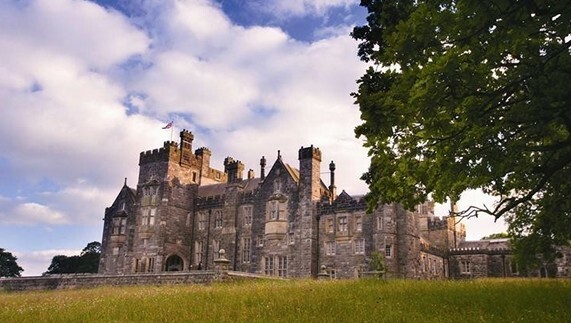 Fancy staying in a castle in Ireland? We’ve rounded up the finest former fortresses where you won’t just eat like a king – you’ll sleep like one too. Demolished, attacked, burned, sacked, sieged, extended, redesigned and beautified: Ireland’s castles have seen a thing or two. And their builders? Some were Norman warriors sharing their warring expertise with the locals; some were built as bastions of British rule and some were just built to show off. Regardless of how or why they were built, we still get kick of giddy childish glee when we walk over flagstones. And as it turns out, Ireland’s castles aren’t just for a day: they’re for a vacation. 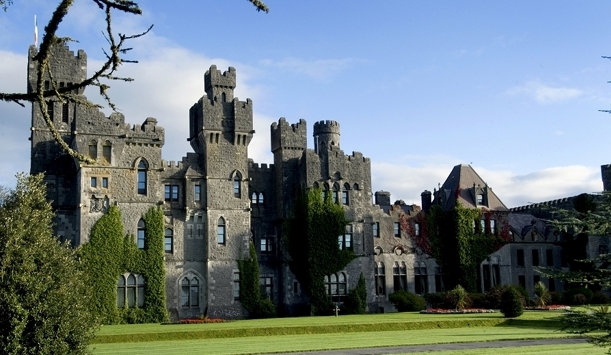 Introducing some of Ireland’s finest luxury castle accommodation. Ashford is one of Ireland’s superstar castles and rightly so. Originally built in the 11th century, it’s a castle hotel heavyweight when it comes to luxury accommodation. A five-star hotel, Ashford has won countless awards and accolades since it opened its doors to guests in 1915, including Best Resort Hotel in Europe from Condé Nast Traveller. Besides its opulent interior, the 26,000-acre estate is worth a look too while the golf course means your clubs are a pre-requisite if you’re serious about improving your swing. Water lovers can partake in kayaking or cruising on the estate’s lake or stick to dry land and cycle around the grounds. Ashford has star quality, too. 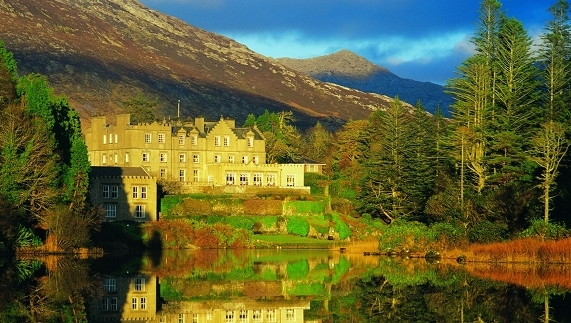 While John Ford filmed The Quiet Man in nearby Connemara, many of the film’s stars stayed here. And to top John Wayne, – Oscar Wilde, John Lennon and Ronald Reagan have also been guests. At Crom Castle, you don’t just live like aristocracy; you’ll live with them. It’s thanks to Lord and Lady Erne – whose family has called Crom home for seven generations – that this chunk of Lough Erne located lavishness has been opened to you and I. Located on the picturesque Lough Erne at the heart of Fermanagh’s Lakelands, Crom Castle is a northern delight. Built in 1830, it has been the scene of many a battle in its time. Lounge by the lake, stroll around the 1,900 acre grounds or retire to one of your many rooms with a good book. If you don’t believe that this is a castle classic, just see how much fun Travel + Leisure had here. The present house was built in the 17th century but the original settlement goes back another 200 years when it was the ancestral home of the ‘Ferocious O’Flaherty Clan’. They became even more feared when Donal O’ Flaherty acquired an interesting wife in 1546 – the infamous Pirate Queen, Grace O’Malley. Such was Grace’s notoriety she gained an audience with the other monarch of the time, Queen Elizabeth I. Nestled in the heart of a 450 acre estate, Ballynahinch now has literary ties to the local Galway community and publishes art or literary works that relate to the property, locality or people. You could easily spend your entire vacation on the estate with walking, hiking, angling, cycling and woodcock shooting all available. Sheen Falls Lodge has existed in some form or other since the 16th century when it was a farmhouse owned by Marquess of Lansdowne. His family turned it into a fishing lodge for almost seventy years before it was bought in 1948. Sheen Falls has an action packed activities schedule for those who can’t bear to be idle and with the Ring of Kerry on your doorstep, you’re just a drive away from road-trip heaven. After all the adventure, book a treatment in the spa to unwind and forget your troubles. Then again, what troubles could you have when you’re in a five star hotel in the heart of County Kerry? With its collection of tall turrets and magical woodlands Lough Eske Castle is bursting with fairytale credentials. It has of course been renovated and upgraded since the original build around 1474 but Eske remains an important historical site. Entering the castle, you’ll be greeted by an intricately carved oak staircase, gleaming marble floors, roaring fires and sheer opulence. The fairytale fantasy continues right up to the fine dining and accommodation. County Donegal is a walker’s paradise and there’s no better route than the International Appalachian Trail, which passes by the castle. The Wild Atlantic Way also winds up in Donegal so Lough Eske could be your final fabulous destination. 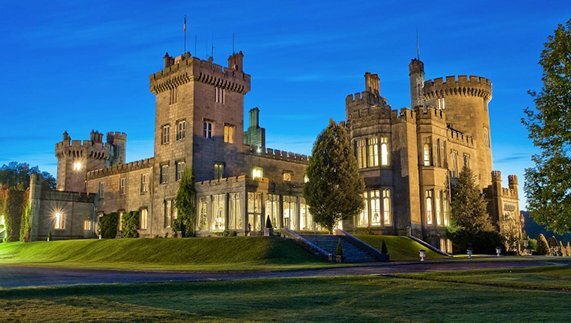 Dromoland Castle is celebrating 50 years as a castle hotel this year. But its career as fully functioning castle goes back much further. Built in the 9th century as a defensive fort, the site here has been the HQ of the O’Brien Clan for centuries. The O’Briens remained there until 1962 when the castle was sold. To ring in this milestone the culinary staff at Dromoland has devised a ‘Nostalgic Tasting Menu’, which dates to 1963. Their dining room has welcomed many famous faces too: President Bill Clinton and First Lady Hillary Clinton, President George W. Bush and First Lady Laura Bush, President Nelson Mandela, Chinese President Xi Jingping, The Beatles, Mohammad Ali and Colin Farrell. 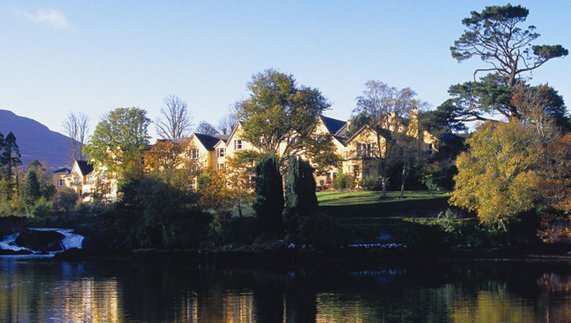 This five star country house hotel was once home to the Coote family, who lived there for 100 years. When they left in the early 20th century, the building became a boys school run by the Patrician Brothers. The website has a host of fantastic imagery from time gone by so you can visualize how it previously was. Nine years were spent restoring it to its former glory and then it reopened in 2011 as a fully functioning hotel. The Slieve Bloom Mountains provide the dramatic backdrop to this hotel – it’s a view worth waking up to. It’s said that you can see half the counties in Ireland from atop these mountains but if you don’t fancy the climb, wander around the foothills exploring nearby villages and towns. 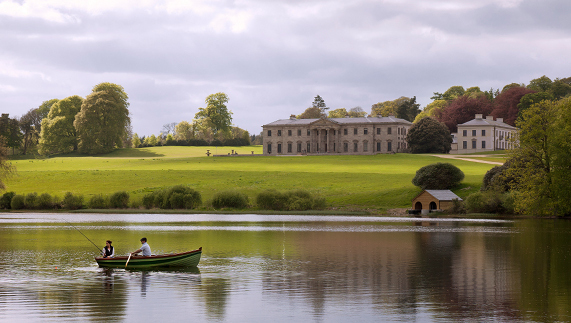 So, if you’d prefer a cozy castle-esque structure, the grandeur of a five star luxury hotel or maybe even a manor or country house, Ireland will have the accommodation to suit you. Churches in Ireland conceal puzzles, hidden histories and the downright bizarre, check out these tales from the crypts. Two nights at The Granville Hotel with bed and breakfast and one evening meal from €129 p.p.s.